Soak navy beans in 8 cups of water for at least 6 hours at room temperature. Use a strainer to drain and collect all beans. Rinse the beans under fresh water before cooking. Transfer the beans into a 4 qt saucepan, add 5 ½ cups of water and boil over high heat with cover on. Foam will be formed during the boiling time; carefully watch the pot to avoid any spilling from boiling. After boiling for 10 minutes, turn the heat to low and let the beans simmer for 45 minutes. Meanwhile, heat a sauté pan over high heat until it is hot. Add oil and wait for 15 seconds. Add spring onions into the sauté pan and stir continuously until the spring onion is fragrant. Mix potatoes, sautéed spring onion, salt, and black pepper into the beans. Turn the heat to medium until it is boiling. Simmer for another 15 minutes or until potatoes are soft. Remove the sauce from the heat. 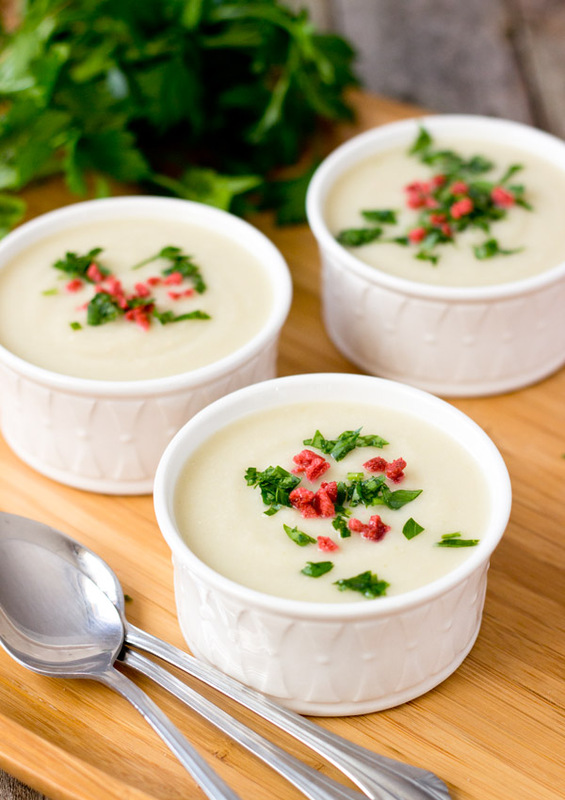 Use an electric hand blender to blend the soup until it is smooth. Garnish with parsley leaves and bacon bits. Serve hot.